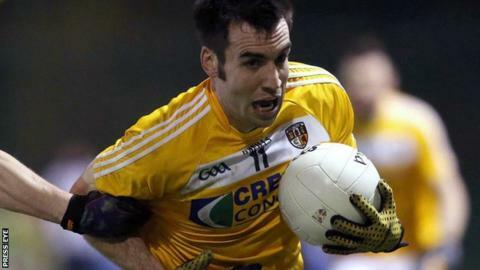 Antrim's Football League Division 4 campaign got off to a positive start as they earned a deserved 1-12 to 0-10 win over Carlow at Dr Cullen Park. The excellent Michael McCann hit five of Antrim's points with Kevin Niblock notching their goal in the first half. Antrim led 1-4 to 0-5 at half-time with McCann registering three points. Five straight points after the restart increased Antrim's lead to seven and while Carlow cut the margin to three, the Saffrons hit the last two scores. McCann hit the opening two points although Carlow hit back to lead 0-3 to 0-2 helped by two Paul Broderick points. However, Carlow then suffered a major blow when Broderick, only just back after a serious ankle injury, hobbled off with a suspected recurrence of the problem. Niblock's 26th-minute goal edged the Saffrons ahead and they looked in a good position at the break as they led 1-4 to 0-5 despite having played against the breeze. With Tomas McCann and Conor Murray becoming increasingly influential, Antrim hit five unanswered points after the restart with James Laverty and Nibock among the scorers. However, Niblock was forced off in the 55th minute after suffering a dead leg and Antrim joint manager Gearoid Adams said after the game that the St Gall's man could be a doubt for next weekend's home contest against Wexford. From looking out of the contest at 0-5 to 1-9 in arrears, Carlow hit five of the next six scores to cut Armagh's lead to only three points with six minutes left. As Carlow continued to press, they had the ball in the net but it was ruled out for a square ball. In between Antrim's two closing points, Saffrons midfielder Niall McKeever and Carlow's Brendan Murphy were both sent off in injury-time after they picked up second yellow cards as they continued their running battle until the end.